I have used tons of topics, the tulips needed them:). I started with a panel cut from blueprint 13 and the inside from BP 5. I started making my scene, all stamps, stencils and dies are from MFT. 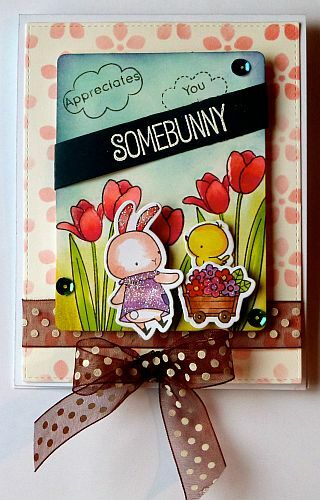 I stamped tulips, die cut the bunny his basket and the birdie(it is adorable). Colored them all with copics. Leaves-YG03 and 06. Tulips- RV13, R22, R85 and RV06. Bunny E02,11,R22,R20,V12 and 15, pocket has 17. Birdie-Y08 and 02, basket E33,35,37,44. YR18 and 68, V12,15, R22 and 85. Sponged the sky with distress inks-tumbled glass and chipped sapphire, bottom with shabby shutters. Stenciled the background with spun sugar. I embossed the sentiment with Hero arts white embossing powder. Added sequins, a ribbon at the bottom instead of the circles. tickles to the bunny and cart. Glossy accents to the tulips. Here is a simple inside. 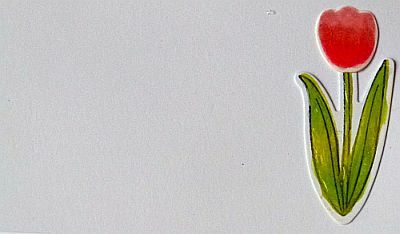 I am also adding it to Simon Says Stamp– create your own background; Artistic inspiration– Anything goes with a twist of spring and loves rubber stamps- add flowers. I am adding it to AAA– i loved their tulips, though i do not know if this CAS. Eye mask helps relax the inside of your eyes, ours are made with flax seeds, lavender oils and lavender buds, find that relaxed sleep, it also helps breath. Go see here. What a sweet card! Love all the spring symbols you added to it! Your secretary will be so tickled! Thanks for sharing this with us at the Simon Says Stamp Wednesday challenge! SUPER CUTE! 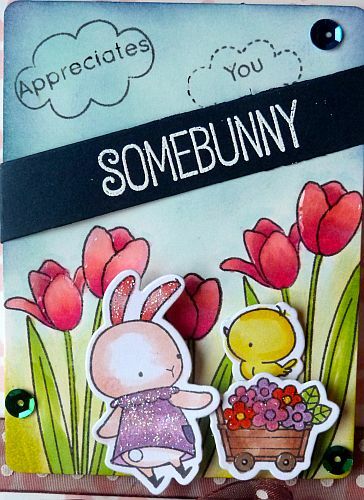 Love the popped up bunnies – Thanks for joining in at AAA! Well one secretary is going to feel very appreciated! Super cute and fun card. Thanks for playing at AAA Cards. Love these colors and the fabulous scene. Thanks for playing with us over at Loves Rubberstamps!! !